A new, beautiful, statement necklace with butterflies in teal shades, inspired by a famous artwork! In my pictures you can see the original illustration, not included in this listing. I choose butterfly images from real pictures and vintage illustrations. Then I print them on high quality silk organza, handcut one by one and seal each one to prevent fraying. There are about 18 butterflies on this necklace and each one measure from 4 to 7 cm. The antique bronze chain is long about 45 cm. (18 inches) with a frontal pendant of 10 cm. where butterflies and wings are hanged. Y shape necklace. I’ll ship this romantic necklace gift wrapped, for you or your loved one. I love Benjamin Lacombe (French illustrator) and his beautiful artworks! 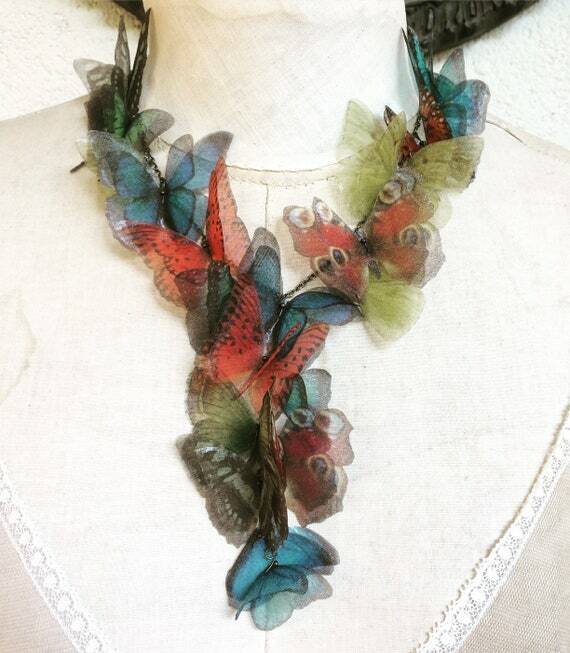 He often include butterflies in his illustrations and this special necklace, completely handmade with silk organza butterflies, is inspired by his “Madame Butterfly”. Really a statement necklace! There are about 35 butterflies on this necklace and each one measure from 4 to 7 cm. The antique bronze chain is long about 45 cm. (18 inches) with a frontal pendant of 8 cm. where butterflies and wings are hanged. Y shape necklace. 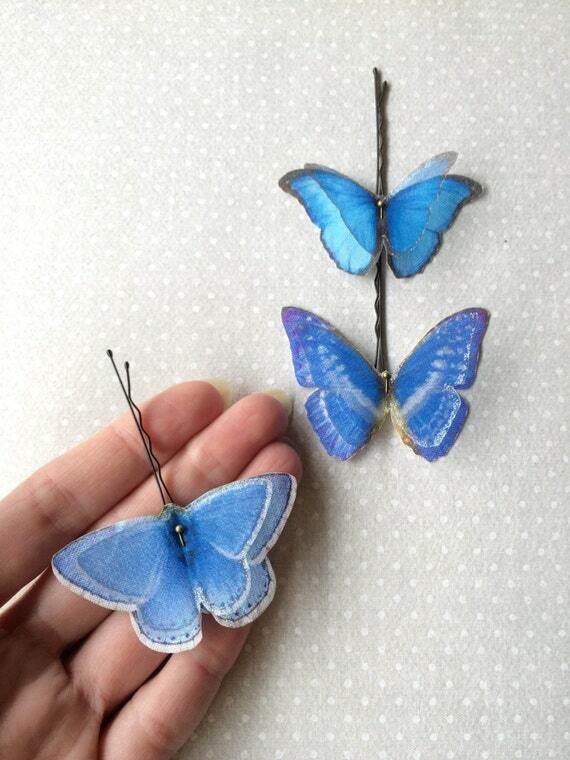 Lovely hand-made bobby pins with turquoise shades butterflies. I chose dragonfly images one by one, from real pictures and vintage illustrations. Then I printed them on high quality cotton and silk organza, hand-cut and sealed to prevent fabric fraying. 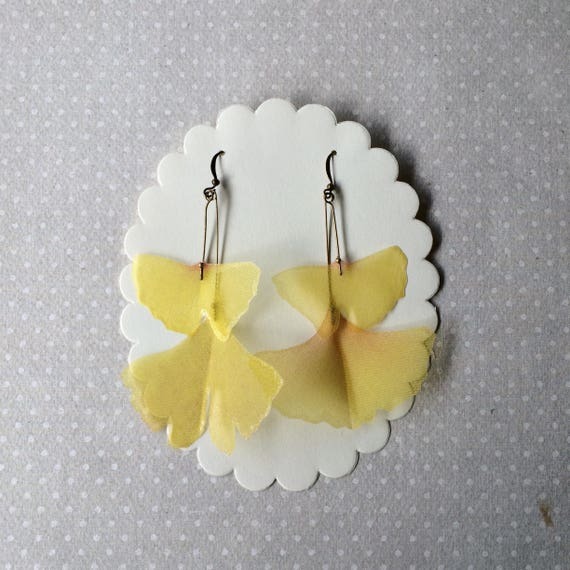 Completely hand-made earrings with silk organza Ginkgo Biloba leaves. There are 4 leaves on these earrings and they’re long about 8 cm.